It is a very hopeful sign of the new “springtime of holiness” for the Church that, in ever more places, the faithful are participating in regular adoration of the Most Blessed Sacrament. Very early in his pontificate, St. John Paul II established adoration chapels in the major patriarchal basilicas in Rome, realizing that the holy Eucharist is the source and summit of life in the Church. When there is faith, devotion and reverence for the Eucharist, the faithful grow in charity and holiness, and the community is blessed with a variety of vocations that serve the Church and all souls with joy and simplicity. The Eucharist is the source of life for the Church. 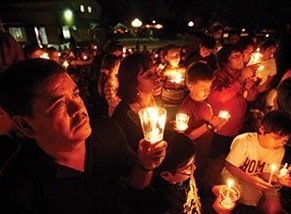 “Perpetual adoration occurs when parishioners, religious orders and communities, and other interested people arrange their visits to Church in an organized way. Typically, two or more people, taking turns, spend an hour, in prayer and silence, before the Blessed Sacrament reserved in the tabernacle. The hours of the day or night are so divided that adoration is considered perpetual or extended over a period of time. Why is it required to have two people present? Safety! In case something happens to one of the adorers (falls asleep, faints, has a medical emergency, etc.) the other can call for aid while at the same time insuring that the Most Blessed Sacrament exposed in the monstrance is not left unattended. Why should we not leave the Most Blessed Sacrament in the monstrance unattended? First, out of courtesy, and second for safety, because — while in the monstrance — the Eucharist is vulnerable. 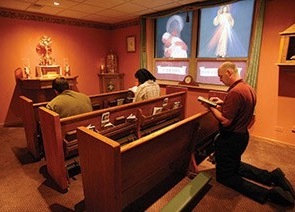 It may happen, no matter how hard you try, that sometimes there is only one person in the Adoration chapel. When that happens, that person cannot leave until another person arrives, or if that is not possible, that person should carefully repose the Blessed Sacrament in the tabernacle or secure the safety of the Eucharist in some other way. Finally, those good souls who are entrusted with managing the Adoration program at their parish should continue to promote Adoration so that there be at least two people there at all times. This may be difficult, but it’s well worth the effort.